1 Woman, 650 Kilometres, 15 Days… - For 1 Great Cause. 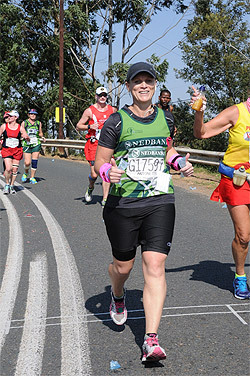 A Robertson resident and acknowledged long-distance marathon runner, Antonette Greenaway, is taking on her most gruelling marathon and challenge yet - all in aid of Breede River Hospice - in recognition of the incredible, soul-touching work they do throughout the Langeberg region. What is likely to be the first feat of its kind to be taken on by a single South African woman, Ms. Greenaway will start off in Port Elizabeth on 1 March and head home to Robertson via the famous Route 62. Dubbed the “Run Route 62 - Have a Heart for Hospice” Marathon, this is one huge undertaking that is worth every bit of attention it can draw. Breede River Hospice in Robertson is a community ‘beacon’ of hope and support that provides their services entirely for free. Beyond caring for terminally- and chronically ill patients, they reach far deeper into their local community providing a whole range of home based care and support services. These include TB/HIV-Aids Prevention, Counselling and Support, private nursing care, ‘Mother and Child’ care, Child and Adolescent Health and Nutritional Support to name a few. Since she announced her intention only last week, several supporting teams and associations have already committed to her cause. Harley Davidson in Cape Town and the Breede River HOG Chapter - both known for their charity motorcycle drives have promised their support - with a convoy of motorbikes keeping the road ahead clear for her - from Montagu to Robertson. Sponsorships can be either ‘Rate per Kilometre’ or ‘Once Off’ Donations. To add your pound’s worth to this truly worthy cause, please contact Charmaine at Breede River Hospice on Tel: 023 626 5710 - or email: events@hospicebreederiver.org.za. Sponsorship forms can be emailed or downloaded from their Facebook page. South Africa has many World Heritage Sites by UNESCO: iSimangaliso (Greater Saint Lucia) Wetland Park (1999), Robben Island (1999), uKhahlamba (Drakensberg) Park (2000), Mapungubwe Cultural Landscape (2003), Cape Floral Region Protected Areas (2004), Vredefort Dome (2005) and Richtersveld Cultural and Botanical Landscape (2007).